At the end of October 2013, there were at least 54 political prisoners in Papuan jails. The number of political arrests have increased significantly since August 2013 and this continued in October, with scores detained at peaceful demonstrations across Papua. Although the majority of detainees are released, there are reports of police intimidation – in Biak detainees were forced to sign statements of compliance. On 16 October, three activists were detained for several hours following a prayer session held in Kaimana to celebrate the anniversary of the formation of the International Parliamentarians for West Papua (IPWP). On 19 October, the leader of a demonstration commemorating the second anniversary of the Third Papuan Congress, Piethein Manggaprouw, was arrested and charged with treason and incitement. There are reported concerns regarding the health of detainees in the Biak, Timika and Aimas 1 May commemoration cases. The six detainees in the Biak 1 May case now face charges of treason, incitement and possession of explosions and firearms. In the Aimas 1 May case, the seven detainees are being made to testify against each other. The Prosecutor in the Sarmi treason case has demanded a four-year prison sentence for three of the detainees. Calls have been made for accountability and transparency in police investigations of the death of Alpius Mote, who was killed by police Mobile Brigade (Brimob) officers in a sweeping operation on 23 September. Dozens of activists were arrested in peaceful demonstrations held across Papua commemorating the second anniversary of the Third Papuan Congress on 19 October 2013. According to a report by a local human rights investigator, security forces attempted to disperse demonstrations in Jayapura, Yapen and Sorong. According to the same report, 22 activists were arrested in Fak-Fak and detained for several hours before being released. Three of those detained were the organisers of the demonstration – Daniel Hegemur, Imbron Kutanggas and Yanto Hindom. In Biak, a joint military and police task force arrested 29 demonstrators, including 6 women, and detained them for several hours in Biak Regional police station. Local activists reported that those arrested were forced to sign a statement declaring that they would not carry out any political activities. The leader of the demonstration, Piethein Manggaprouw however remains in police custody in Biak Regional police station and has been charged with Articles 106 and 110 of the Indonesian Criminal Code for treason and incitement. Five prominent Papuan activists remain behind bars for their peaceful involvement in the Third Papuan Congress on 19 October 2011. Forkorus Yaboisembut, Edison Waromi, Dominikus Surabut, August Kraar and Selpius Bobii are serving three-year prison sentences for treason. On 16 September, civil society groups engaged in political actions in different cities across Papua to celebrate the anniversary of the formation of the International Parliamentarians for West Papua (IPWP), a cross-party group of politicians from around the world who support self-determination for the people of West Papua. In Kaimana, a prayer session was conducted at the Secretariat offices of the Kaimana Community Council (Parlemen Rakyat Daerah Kaimana, PRD Kaimana) from 9:00 to 13:00. According to reports by local activists, three men were arrested later that night around 21:30 under instructions from the Head of the Kaimana Regional police. The three activists from the KNPB (Komite Nasional Papua Barat, West Papua National Committee) arrested were Barias Bary, Luter Soba and Isay Irini. They were reportedly released the next morning. Activists reported that a joint military and police task force raided the PRD Kaimana Secretariat offices to make the arrests, damaging the Secretariat gates. The security forces had also ransacked the residence of the Head of PRD Kaimana during the search to arrest the three men. They allegedly also confiscated a kitchen knife and machete, a bamboo spear used for fishing (tombak ikan) and a PRD Kaimana guestbook. KNPB activists reportedly stated in Papuan news site Tabloid Jubi that shots were also fired outside the residence of the Head of PRD Kaimana. According to local activists, Kaimana police stated that they were searching for a suspect in a murder case. There were no reported releases in October 2013. The trial of six men in the Biak 1 May case began on 28 October with the indictment hearing. Oktovianus Warnares, Yoseph Arwakon, Yohanes Boseren, Markus Sawias, George Syors Simyapen and Jantje Wamaer face charges under Articles 106 and 110 of the Indonesian Criminal Code for treason and incitement and Emergency Law 12/1951 for possession of explosions and ammunition. The prosecutor’s statement accused the six men of belonging to the armed TPN/OPM (Tentera Papua Nasional, Papuan National Army / Organisasi Papua Merdeka, Free Papua Organisation) group and stated that they had allegedly forced members of the community in Biak at gunpoint to participate in the flag-raising ceremony on 1 May 2013. Markus Sawias was accused of threatening Yonadap Rumbewas, an army officer with the Biak Regional Military Command Intelligence (Intel Korem Biak) with an airsoft gun. The Letter stated that Rumbewas fired warning shots in the air and reportedly asked for a dialogue with the men, but Jantje Wamaer had allegedly moved to attack him. Rumbewas reportedly reacted by shooting Wamaer in the leg. Oktovianus Warnares is also accused of being in possession of home-made bombs, an airsoft gun and a machete. As reported in previous updates, human rights sources in Papua stated that the flag-raising ceremony was a peaceful political activity in commemoration of 1 May, a date marking the administrative transfer of Papua to Indonesia. Local investigators report that police opened fire into a crowd of 50 people, which led to the injury sustained by Wamaer. Local activists have also previously claimed that the items allegedly found on the six men had been fabricated by Biak Numfor police during the course of the two-month investigation period. As reported in our September update, Yohanes Boseren who was severely beaten on arrest, receiving multiple blows to the head, is currently showing signs of mental illness. Human rights lawyers representing the six men have submitted a request to the Prosecution and prison authorities to release Boseren on humanitarian grounds and to obtain medical treatment, however as yet there has been no response. Local human rights lawyers have also reported that the defence team for the six men has faced intimidation and harassment from officers of the Biak Regional Military Command Intelligence. They were reportedly pushed to provide the full names of all members of the defence team, which they refused to do. An assistant of one of the lawyers, Imanuel Rumayom, was reportedly followed by intelligence officers. There are also reports of a heavy army and police presence at the hearings. The trial of Hengky Mangamis, Yordan Magablo, Obaja Kamesrar, Antonius Saruf, Obeth Kamesrar, Klemens Kodimko and Isak Klaibin in the Aimas 1 May case continued in October with further witness hearings. Information received from human rights lawyers stated that the defendents were made to testify against each other. Lawyers expressed disappointment with judges when they moved to accuse Isak Klaibin when he was called to the stand as a witness on behalf of Obaja Kamesrar. During the witness examination, it was reportedly made clear that aside from Klaibin and Kamesrar who have family connections, the other detainees did not know each other before the commemorative ceremony on 30 April. Human rights lawyers reported that at a hearing on 30 September, Antonius Saruf fainted after testifying, reportedly due to an existing heart condition which has been exacerbated by stress. The same thing happened in detention undergoing police investigations in May. Klemens Kodimko is also reportedly suffering from acute gastric ulcers, but carried on with hearings on 11 October despite his condition. Lawyers have reported that Kodimko had fainted and hurt his head in Sorong prison, where the seven men are currently detained, due to the acute pain he is suffering from. Defence lawyers have asked judges to allow Kodimko access to medical healthcare. In response the judges have informed defence lawyers that they are allowed to visit him in prison with medicine but with the coordination of prison authorities. As reported in the September update, another Aimas 1 May detainee, Obeth Kamesrar, an elderly detainee of 68 years, has reportedly been silent since his arrest and appears to be suffering from trauma. Defence lawyers have stated that they do not consider the witness testimony of officials from the Department for National Unity and Politics (Kesatuan Bangsa dan Politik, Kesbangpol) and the Sorong District Head to be factual. They also stated that testimony previously given by two police witnesses did not sufficiently explain in detail the alleged role of the detainees in the incident on 30 April. Information received from local human rights lawyers indicates that the five men detained in the Timika 1 May case have been charged with Articles 106 and 110 of the Indonesian Criminal Code for treason and incitement. Domi Mom, Alfisu Wamang, Musa Elas, Eminus Waker and Yacob Onawame have been detention since 1 May 2013. Although the trial has already begun, hearings for witness examination were postponed three times, reportedly due to witnesses not being able to attend. The five men were tortured in detention and three of them – Musa Elas, Yacob Onawame and Alfisu Wamang – have been suffering from deteriorating health. Requests from their families to Mimika Regional police officers to provide them with adequate medical treatment at a hospital have been ignored. As reported in our August update, four community leaders – Apolos Sewa, Yohanis Goram Gaman, Amandus Mirino and Samuel Klasjok – were arrested after a prayer session and statement to the press in solidarity with the Freedom Flotilla and charged with treason and incitement. A coalition of human rights lawyers is providing legal support to the four activists who are currently undergoing police investigations in Sorong. It is not yet known when they will face trial for the charges against them. The Democracy Alliance for Papua (Aliansi Demokrasi untuk Papua, ALDP) has reported that a parole application submitted by one of its lawyers on behalf the five detainees in the Wamena ammunition store raid case has been rejected. The authorities at the Directory General of Correctional Facilities (Direktor Jenderal Permasyarakatan, Dirjen Pas)stated that the parole application was not received despite the lawyer’s insistence that it was submitted last year. When asked for clarification, the authorities at Dirjen Pas explained that a complete application was necessary for the matter to be considered. This meant that two documents had to be submitted – a Letter of Assurance and a Statement of Loyalty to the Republic of Indonesia – as the five detainees were charged with treason. This is a requirement under government regulations for crimes against the state. The detainees rejected signing a Statement of Loyalty, which therefore disqualified their application for parole. Applications for parole go through different stages of consideration, starting from prison authorites to the Regional Office for Law and Human Rights in Papua and finally to Dirjen Pas. The five men – Apotnalogolik Lokobal, Kimanus Wenda, Linus Hiel Hiluka, Jefrai Murib and Numbungga Telenggen – were charged with treason under Article 106 of the Indonesian Criminal Code. They were arrested in April/May 2003, as part of sweeping operations by the military in which nine people were killed and 38 tortured and 11 arrested. Three of those arrested have died while serving their sentences. The five remaining detainees are serving either 20-year or life sentences. A report received from ALDP has stated that a request for Jefrai Murib’s life sentence be commuted to a fixed term sentence, has been submitted to the Ministry of Law and Human Rights. They are seeking to reduce Murib’s sentence to 20 years’ imprisonment. Due to an administrative error, a similar request for commutation of sentence for Numbungga Telenggen has been rejected by the Ministry of Law and Human Rights. Biak prison authorities are required to send complete documents to the Department of Law and Human Rights in Jayapura before the process of consideration can proceed. The two men were arrested in April 2003 as part of sweeping operations by the military in which nine people were killed and 38 tortured. Human rights lawyers have reported that after four postponements of hearings for the Sarmi treason trial, the trial resumed on 9 October with the Prosecutor demanding a sentence of four years’ imprisonment for Alex Makabori (aka Isak Demetouw), Niko Sasomar and Sileman Teno, and one years’ imprisonment for Daniel Norotouw. On 23 October 2013, defence lawyers challenged the Prosecutors’ indictment. As reported in our May update, according to an interview with the four men by a local activist, they were arrested on 3 March 2013 following a socialisation event they conducted for residents in Sarmi, aimed at raising awareness regarding the forthcoming 1 May commemorative events. The four men allege that security forces planted evidence in order to charge them. They remain in detention in Abepura prison while awaiting their verdicts. As reported in the September update, on 23 September four civilians were arrested in Waghete in a sweeping operation when two police Mobile Brigades (Brimob) officers fatally shot civilian Alpius Mote. Information from local human rights activists has revealed that the four men have since been released. 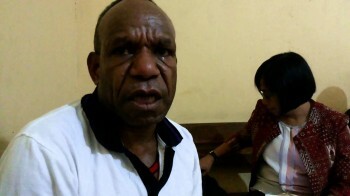 An article on the website of Papuan human rights group Elsham Papua reported that one of the four men, Yance Pekey, had been badly beaten by police officers while detained at Paniai Regional police station. The families of the victims and civil society groups, including the Alliance of Papuan University Students (AMP, Aliansi Mahasiswa Papua) have called for Paniai police authorities to be held accountable following the incident. The Papuan Legislative Council (DPRD, Dewan Perwakilan Rakyat Papua) released a statement urging police transparency in investigations into the incident and for the two perpetrators to be held to account. The Head of Paniai Regional Police, Semmy Ronny TH Abba has stated that he was ready to accept responsibility and be removed from his position if investigations conducted by PROPAM (Provos Pengamanan), the police internal complaints and investigations mechanism, proved police misconduct. In September 2013, the West Papua Solidarity Group Brisbane participated in several language and culture festivals around Australia, setting up information stalls campaigning and raising awareness for West Papua using leaflets, a petition and a photo exhibition. The activist group raised awareness regarding the issue of political prisoners, providing postcards that could be personalised and sent to detainees across Papua. “An Evening With(out) Filep Karma,” Amnesty ? On 18 October 2013, an event was held at the Reading International Solidarity Centre campaigning for the release of Filep Karma, currently serving 15 years’ imprisonment for his participation in a peaceful flag-raising ceremony in 2004. Established human rights campaigner Peter Tatchell, International Lawyers for West Papua (ILWP) Co-Founder Melinda Janki, and former political prisoner and leader of the Free West Papua Campaign Benny Wenda spoke at the event, highlighting issues faced by Papuan political prisoners. *Even though Edison Kendi and Yan Piet Maniamboi have now been released from detention, they are still currently facing a prison sentence of 2 years’ and 18 months’ respectively. The verdict is currently being appealed. As reported in our September update, Kendi was again detained and questioned in relation to peaceful demonstrations before being released.